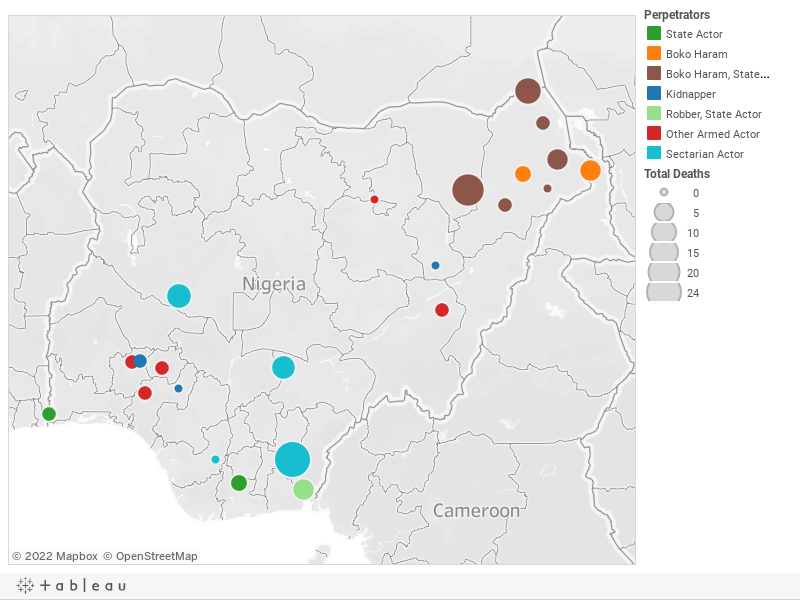 Below is a visualization and description of some of the most significant incidents of political violence in Nigeria from December 1 to 7, 2018. This update also represents violence related to Boko Haram in Cameroon, Chad, and Niger. These incidents will be included in the Nigeria Security Tracker. December 1: Two suicide bombers killed themselves but no others in Maiduguri, Borno. Boko Haram was suspected. December 1: Eight soldiers and ten Boko Haram militants were killed during a battle in Gujba, Yobe. December 2: Sectarian violence led to seven deaths in Apa, Benue. December 3: Sectarian violence led to "dozens" (estimated at twenty-four) of deaths in Biase, Cross River. December 3: Boko Haram fought Nigerian troops in Abadam, Borno, leading "to deaths on both sides" (estimated at five militants and five soldiers). December 4: Gunmen killed one and kidnapped eight from Osun College in Obokun, Osun. December 4: Nigerian soldiers killed one Boko Haram militant in Damboa, Borno. December 4: Boko Haram killed one soldier in Kukawa, Borno. December 4: Gunmen abducted three health workers and two lecturers in Owo, Ondo. December 6: Boko Haram killed five in Kala/Balge, Borno. December 6: A communal clash resulted in eight deaths in Lavun, Niger. December 7: Boko Haram killed two soldiers in Kaga, Borno.